RAJMACHI – An Adventure Re-lived!! I don’t know from where to start and where to end! It is almost a week since the trek to RAJMACHI got over. Well, the college reopened on 17th Nov.2007 and we were desperately in need for a trek. We decided to have a trek as early as possible. Our aim was to have at least 3-4 hikes from the last week of November to the first week of January. 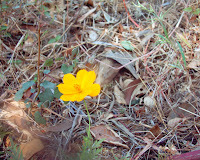 And so we decided to have an overnight trek on 24th-25th November. Thankfully, the committee members of the PODAR HIKERS' CLUB succeeded in convincing Prof. Rajendra Phadke (the Chairman of the Club) to plan a trek to RAJMACHI. It was sir’s idea that we go for a night hike and yes, that was a very good idea indeed because the night of 24th was a full moon (poornima). We had a week’s time to carry out the pre-hike activities. We got the permission from the college and notices of the hike were put up in the college. We got a good response and eventually finalized a 54 seater bus. All the requirements were fulfilled and the reporting time was fixed at around 9pm on Saturday, the 24th. From whatever information I had gathered about RAJMACHI, I can put it like this; RAJMACHI is situated in between Karjat and Lonavala (Khandala). It takes about 3 hours by road from Mumbai. It is a twin peaked fort. There are two citadels (forts) known as Shrivardhan and Manoranjan at the top. While Shrivardhan is the higher of the two, the RAJMACHI village is situated at the foot of Manoranjan. 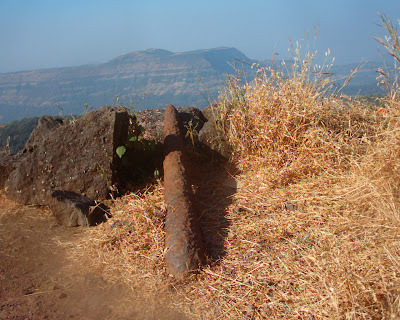 The RAJMACHI fort is one of the prominent hill forts guarding the Bhor ghat which was used as a trade route connecting the western coast and the Deccan plateau for many centuries. The base village is Kondivde. 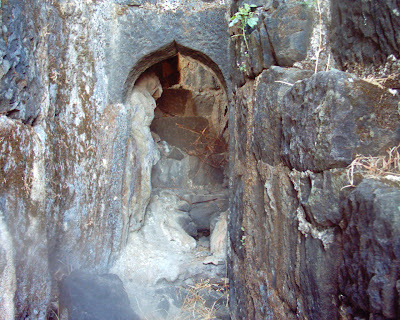 The famous Buddhist caves, Kondana caves, also lie near the base of RAJMACHI. Sir had ensured that all arrangements for the whole group regarding the stay, breakfast and lunch had been properly accomplished. Sir has contacts with many active persons from the hiking community. With the help of one such active person, Mr. Mukund Gondhalekar (Secretary of the Rajmachi Rural Aid and Development Programme), we were able to get our guide, Ankush (kondu) who stays in the base village of Kondivde and is well-versed with the RAJMACHI area. Sir also contacted Mr. Umbre, the ex-Sarpanch of the RAJMACHI village, who hosted us for the night stay, breakfast, tea, and lunch. We left the college at 9:30 pm. The journey was a short one, of about 3 hours. We must’ve reached the base village Kondivde at around 12:20 am and started our trek at around 12:45 am. This was, of course, after sir gave a few instructions to the group. This was to be my second night hike. The group had been specially instructed to carry sweaters and torches, which proved to be handy as it was very cold in the night and the temperatures, were maybe as low as 10 degree Celsius. The first half hour was a gentle walk as the slope was gentle too. But steadily and slowly the slope became steeper and the terrain difficult. This was evident from the fact that most of us had removed our sweaters as we were sweating already. At least I was no more feeling cold. My heart was pounding thud…thud…thud… even as beads of perspiration ran down my forehead. I was enjoying and why not? After all it had been almost 4 months since my last hike. Climbing is considered a good exercise for health anyways. The group rested wherever it found open space. We were sweating alright but the cold wind blew the heaven on us. It refreshed the tired trekkers. Once again we were breathing to the hilt of our lung’s ability. The sky was bright with the full moon and the twinkling stars above and then there were these tiny lights blinking in the village below. That was a very superb view. And someone rightly shouted, “Taare Zameen Par”. As the trek progressed, most of us had stopped using the torch as the full moon shone brightly and provided enough visibility. It was so calm and wonderful. Soon we reached the final stage of the climb. We reached a plateau where the village was situated. We could clearly see the Manoranjan fort in front of us. A 10 minute walk led us to the village, which I would say was fairly well developed. We were welcomed by the barking dogs. It was really very cold up there and add to it the blowing winds. Wow! We were almost chilling! 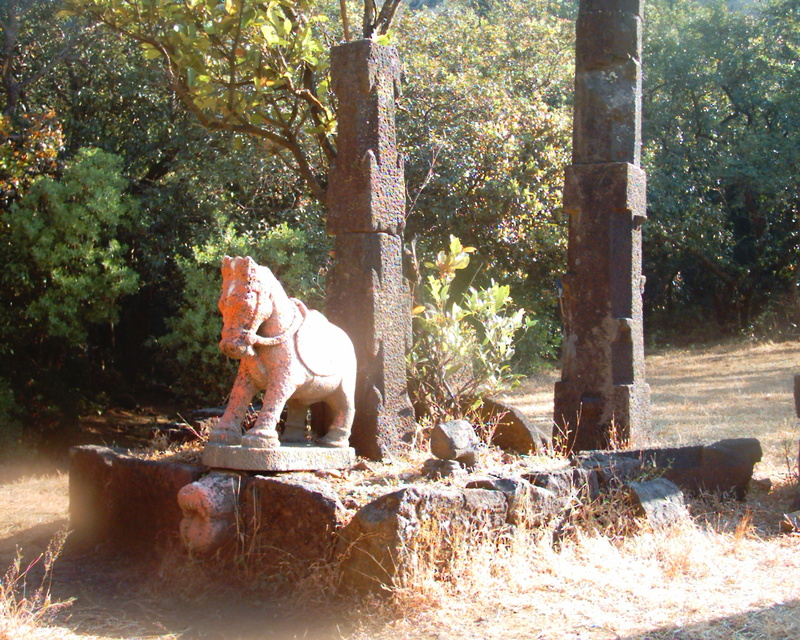 The Rajmachi Rural Aid and Development Programme, which is a non-profit NGO provides camping facilities to trekkers. 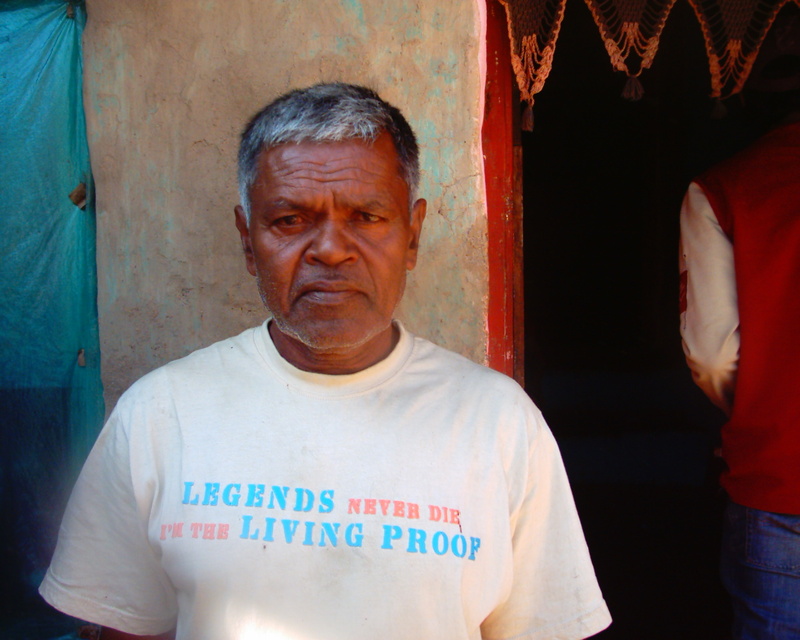 But since the hall provided by this organization was already booked, Phadke sir had made arrangement for the night stay at Mr. Umbre’s house. The allotted two rooms were adequate to accommodate the group of 50. Everyone quickly occupied the available space. It felt really very good and homely inside. The house provided us warmth. I don’t remember what time it was—it must’ve been 4 am. Soon the lights were switched off and everybody fell asleep wondering what the next day had in store for them. I myself slept for 2 odd hours and woke up at about 6 am. Most of them were deep asleep. The sleep, though a short one, was enough to refresh me for the day’s adventures! I had planned in advance to get up early and witness the sunrise and as determined, took my camera and sweater and moved carefully out of the house so as not to disturb the sleeping lot. I found a few of my friends awake—Nimesh, Vicky, Aman and Meghana. We all stepped outside. Let me tell you, it was still very cold out there. But then, we all had become used to it. So that was not a concern. The moon was still visible – that bulging, bright full moon! The trees waved and the leaves fluttered as the wind blew, whispering away into the woods. We set out in the hope of seeing the first sunrays of the day, but we were not so lucky. The sun rose from beyond the Shrivardhan fort, so we couldn’t see it. I must admit though, that the change in the colours of the horizon was so beautiful.…from black to dark blue to vermillion orange and yellow and finally light blue….it was awesome and unforgettable. We clicked some photos and were on our way back to the house. 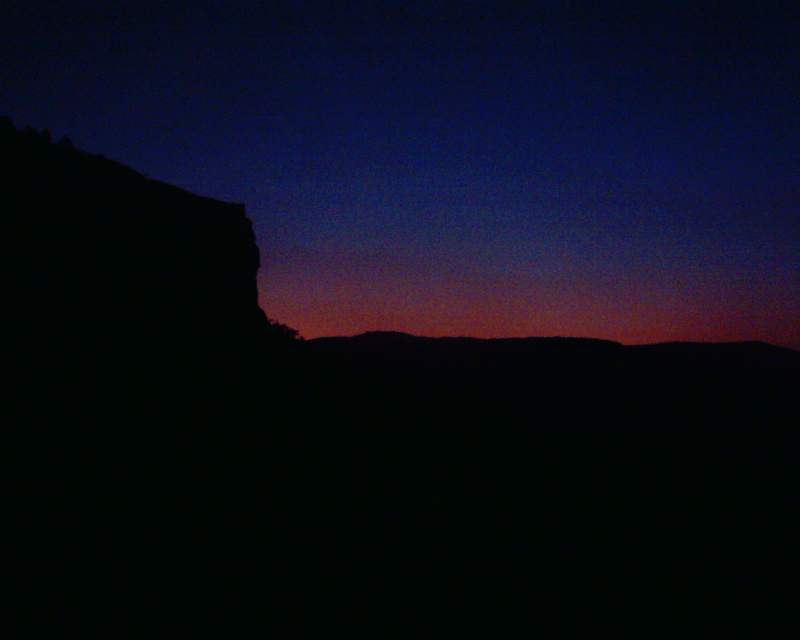 It was dawn and many other hikers had already begun their adventures. Soon it was time for breakfast – ‘pohe’ with hot tea. 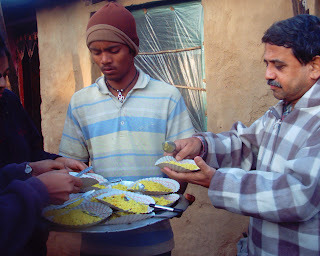 The Sarpanch and his family served us well and everyone enjoyed the breakfast. Now it was time to start the day’s adventures. The plan was to visit both the forts and return till lunch time. So after carrying only the necessary things like water etc., we left our backpacks in the house itself and once again resumed the trek. Trekking in the day is completely different from the night. The early morning was cold enough, but naturally as the day progressed, the temperatures came back to normal. On our way, there were a couple of caves. Soon we reached the col between the two forts where a temple is situated. From here, both the forts were accessible, but we had planned to first visit the smaller of the two peaks (Manoranjan). The view as expected was outstanding and beautiful. Once at the top, we could see the base village and the pond as also the valleys and the ranges right up to the Duke’s nose in the south, which Chinmay (committee member by estoppels, ha-ha!) identified quickly as he had been to RAJMACHI several times before and was hence desperately pushing for this place in the committee’s meeting earlier. One can easily mistake Duke’s nose for Naneghat, as both resemble each other a lot. We could also see the Dhak-Bhairi range to the north. After posing for photographs on this ruined fort which had the main entrance and fort walls still intact, we quickly descended towards the temple. And from here began the climb towards the top of Shrivardhan. The climb was calm as the sun was still on the other side of the fort. But as we moved across to the other side of the hill (west to east via the southern slope), the sparkling and dazzling rays of the sun welcomed us. On sunny days, sunglasses are recommended, as one not only looks good in them but sunglasses also protect the eyes from direct sunrays. Shrivardhan being the higher of the two peaks provided a great view of the surrounding region. 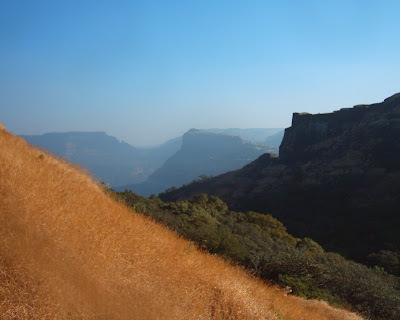 We could see the lake Shiravta in the east, the Dhak-Bhairi in the north, Manoranjan fort in the west and the rest of the Sahyadri range as far as the eye could see. The view was marvelous and unobstructed. Then there was this flag post atop the fort. Some of the group members immediately conquered it and I am sure the photographs must’ve come out really good and memorable too. There were other hikers too. There was another route to get down which passed through the northern slope facing Dhak-Bhairi. But eventually both the routes combined halfway down the fort’s western slope and then towards the temple on the col. I noticed some hikers from other groups going by this route so I made up mind to use this path to descend. While other people were still at the top, Nimesh, Mayank and myself chose to explore this route. We sat there for a few moments silently enjoying the beauty of Mother Nature. The view was fascinating. We followed the trail further ahead which led us to a kind of secret staircase and a passageway which I think must’ve been used by the troops in those days to keep a vigil on the valley below. The construction of these forts is really laudable. They must have been built centuries ago. Others had left the top by then and descended from the old route. When we reached the main route, some of our friends were ahead of us, while quite a lot were still behind. We reached the col and rested near the open space in front of the temple. Lunch time was nearing. Some had still not descended…some were resting…and some others led by Chinmay, Krish etc. had gone to explore some old bungalow. Those who were resting, were lucky to enjoy the cool & refreshing ‘kokum sherbet’. It was paisa vasool. It was noon already. We all then headed back to the village where we had our lunch. We were served ‘pithla-bhakri’. What a superb event this hike was turning out to be! After lunch, we packed our bags and prepared to leave the place not before thanking our generous hosts for the homely treatment we received. We then went ahead to meet Mr. Mukund Gondhalekar, who as the Secretary of the Rajmachi Rural Aid and Development Programme is doing a good job for the welfare of the people of RAJMACHI. He briefed us on the history of the fort and the life of the villagers. He also told us about the activities carried out by the Rajmachi Rural Aid and Development Programme. He explained how we students could also contribute to this. Some students also interacted with him. Soon it was time to say good bye to this beautiful place-it was time for us to leave behind memories of a wonderful trek. One thing I have always noticed in any trek is that while climbing up, there’s one leader-one group (as everyone is new to the place), but while descending-the main group separates into smaller groups. This unique feature of a trek makes it more exciting and enjoyable. Every one is keen on getting to the base as fast as possible. Nobody waits for anyone except, of course, sir and the core committee members and experienced ex-podarites, as it is their responsibility to ensure no one is left behind. There is a possibility of someone losing the way. So I would say descending is more adventurous also because most ‘goals’ are scored while getting down. I myself led a few people almost down a wrong path until our guide shouted from back and signaled that we were on an altogether different path. Everyone was glad that they were once again on the correct path. All routes will take you down but it is important to get down on the correct side of the mountain (read: where the bus lies!). It’s difficult to remember routes especially when the ascent was during the night! Mahesh, Krish, Sagar, Mohit, Anandita were far ahead and were probably the first ones to reach the base. Vicky and his group were also ahead of us. Aman, Satsheel, Dhawal, and myself were somewhere in the middle. Many others along with sir were still behind us. Then once again there was a diversion-one of the route was the original one which we had used to climb up during the night. While the other route passed through the Kondana caves. Chinmay and a few others went along the new route. Actually, they had some other hiking group with them who promised to guide them in exchange for drinking water. Dennis, Gaurav, Meghana, Archana and some others proceeded along the tried and tested path. I decided to rest there itself and wait for sir and others to come. Not that I did not know the path, but I thought I must stay there and wait for them. Aman, Dhawal and Satsheel chose to wait with me. We waited for quite a while but there was no sign of the last group. Eventually we all decided to continue further assuming all was well with them. We four of us were now alone. Others had already gone much ahead. Soon the way seemed like a ‘bhool bhulaiya’. 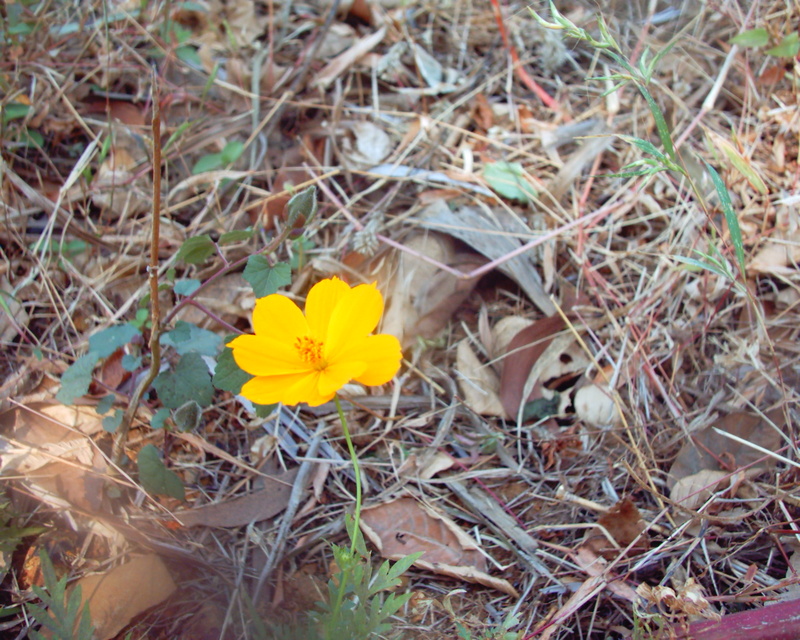 The area was thickly forested. The route did not seem familiar at all. How could we recognize the paths we had used in the night? We weren’t sure where we were heading. But then, whether the way was right or wrong, there was no option but to continue. We kept assuring ourselves that ultimately all routes would take us downwards. We kept moving frantically until we reached a hut. At last we had reached the base, but this was not the base village. On inquiring about Kondivde village, we were shown the directions by a villager who was probably drunken and offered to take us along. But we refused and proceeded further until we reached another settlement of houses. Here we were glad to see some familiar faces--Vicky, Shahu and others were resting there. The kind villagers provided us much needed drinking water. Then suddenly, Satsheel spotted some ostrich-like birds. So he and Dhawal proceeded towards the spot. Meanwhile we decided to continue. We were told that our destination was now only 10-15 minutes away. Before reaching the base village, we were joined once again by Dhawal and Satsheel. The bus was parked where we had left it yesterday. We noticed Gaurav and Dennis in a nearby stream (or was it a pond). It did not take us any further to decide what was to be done…!! We quickly jumped into the water. My god the water was too cold. Everyone in there was shivering. Within no time ‘sabka kidaa chalu ho gaya’. We enjoyed a lot. Then we changed into our dry clothes. It was nearing Sunset and there was still no sign of the last group. Most people were in the bus. Even the guide was in his house, where he served tea to the tired trekkers. We were about to send a ‘search team’ as it was getting late. It had almost turned dark. But fortunately as we proceeded a little further, we could see them coming. We heaved a sigh of relief. Sir smiled at us. Considering sir’s experience in trekking, we were sure everything would be alright. It was just that the speed of this group was very slow! Everything was back to normal. After giving the guide his dues and thanking him or his help, we left the place. Before leaving the place I noticed a fire on one of the hills. Was it a natural fire or had someone purposely lit it for cultivation or whatever purpose, I wondered. Nature is so beautiful. But due to human activities, the environment is degrading. Many precious flora and fauna are nearing extinction. This is, I agree a separate topic altogether. How I wish that such important topics be brought to the light of all people! Maybe trekking can help in its own way by contributing something to the conservation of nature. There are several trekkers and trekking organizations which are already involved in the conservation of historic forts, the plant and animal life, i.e. the beauty of the Sahyadri ranges. It would be great to see the PODAR HIKERS' CLUB as a link between the students and nature-which I believe it certainly is. I have always maintained that trekking pulls man closer to nature. Thanks to the PODAR HIKERS' CLUB which gives an opportunity to Podarites to explore their inner self, away from the maddening city crowd. I wish this Club continues this good work for many more years to come.